With the intention of forwarding Terra Alta’s deepening dedication to food forests all the while sharing in the knowledge of this fantastic design element and food production system, a group of 15 new and old friends came together for a wonderful sharing. We dug, we mulched, we propagated plants, we shared knowledge and we worked together seamlessly. And we partied! It was a fantastic gathering and even the gods smiled on us with the weather with a mostly rain free weekend except for one downpour I didn’t see coming being crouched down in our pit garden explaining that earthworks design feature within the overall food forest of terra alta. It all started Friday night with an open night presentation at Escola da Terra in Azoia on a cold, rainy and windy night. Despite the weather we had a crowd of around 30 people from our local and extended community as well as the new students. The presentation shown helped to frame the weekend as to prepare the talk I made a mindmap to make a simplified explanation of the food forest concept. With that we went over that mindmap further in the weekend both in the field with farm tours, learning through the body with hands on, and in our wonderful classroom known as the star dome. the first trees were Feijoa trees thus extending our hedge of them along the stream and accompanying small pond earthwork to slow the water down and trap sediment. Before planting we made tree-planting terraces by cutting into the hillside and dragging that material downhill and mounding excess dirt in a c-shaped bund on the bottom side of the tree terrace. This creates a water-harvesting feature and also allows for a more effective summer planting space for watering as well as soil building surface. Once we did the digging and discussed our guilds, we planted the trees that we bought quite big from a local nursery. To repair the broken soil food web from the earthworks process, we then placed compost on the soil surface allowing it to eventually be worked into the soil by the microbes and earthworms. From there we gave the microbes food resources besides the tree roots in the form of cut green material and also decomposing canas that was the remnants of a 2012 building project. All the while we were propagating plants and recovering those from our nursery and greenhouse where we had previously propagated them. 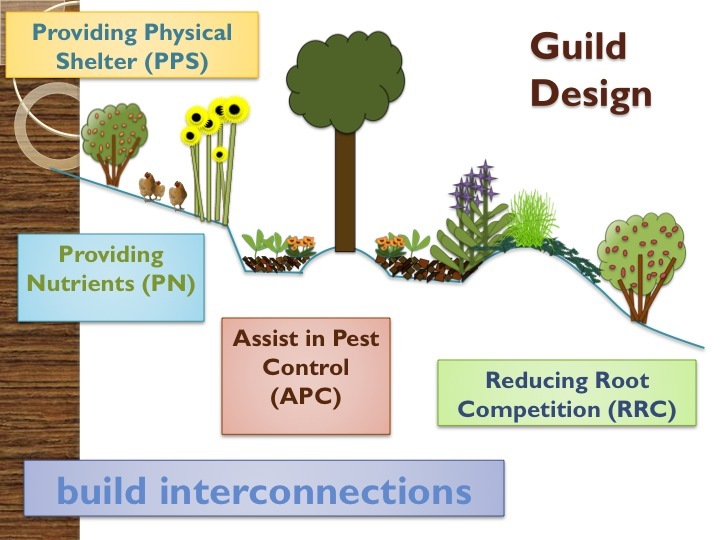 This helped to form the little mini ecosystems known as guilds, allowing for stability and resilience to develop in the system from increased biodiversity. They are also very aesthetically pleasing which we are committed to really portraying in this food forest and section of the land. Other parts of the land got very similar treatments on Sunday after the epic party on Saturday night. In the Van, our Terra Alta band and beyond, played again Saturday night with Pedro and Henrik really shining throughout the festivities. They really put on a great show throughout the night and allowed for an increased group interaction from within the group and those from our outer community who also participated. Thus after the early Sunday lessons on the management of food forests, we went for a small tour to learn from other parts of the land and begin to implement. One of the major food forest management techniques is to do chop and drop which we did by cutting back a quite overgrown lemonwood tree that is south of our now 2-year-old kaki Persimmon tree. The lemonwood supported the Kaki well by creating shade and wind protection but now that the tree is well established it was time to switch the layers and bring the lemonwood down more into the shrub layer through the coppice process. This allowed us to push the kaki more into the sub canopy layer after another year’s growth coming up. All of this biomass was rolled back into the system by creating a contour brush pile to support the already fatty layer of mulch on the slight slope. Other parts of the biomass will be used for poles or firewood and some of the biomass also went to our pit gardens giving them back the convex shape they warrant after the composting process really sped up since the fall rains came early in 2014. As that was occurring we broke into several tree/ guild planting and earth shaping groups and did a bigger phase of implementation. One station was the interior of the serpent garden as we have decided to convert away from annuals in this part of the garden and further the food forest there since many perennial support species are really taking hold and management re-evaluation feedback loops. We added another Kaki to complement the two others in the area. Furthermore, a large grafted pomegranate tree was planted nicely to create the connection between our other one, which has grown into a descent-sized shrub over the last few years. We also added two nectarines, which compliments the other stone fruits in the garden and the eight others we are still going to add over the coming days. Our intention is to farm the outsides of the serpent with annuals but create a more complete ecosystem in the interior with the tree crops and guilds which includes lots of Mediterranean herbs. They are drought hardy thus reducing the time consumptive watering and move our annual production to other spots that can be fitted with drip irrigation easily. It also tailors to meeting our needs of well feeding our bees that are apart of our food forest and one our main dedications at terra alta. We also made progress on two other areas that had a phase of implementation in the 2012 FF course. One was the “Mediterranean garden” which was one of the driest and harshest spots in the garden when we first starting designing that space. Through a couple of sheet mulching projects there and the tree planting, the space is much more green now and even warrants heavy chop and drop that now extends into the summer a bit. Thus we added more to the space to compliment the other existing older trees like walnut, apple, and cork oak and the younger hazelnut, goji’s, grape’s, and olives. For better pollination of the wind driven hazelnut, we added two more young trees, which gives us four and an ample block for this wind pollination. We also added another olive as a sub canopy layer and some goji’s to fill the climber, bush layer. The earthworks also created planting space for guild plants like geranium, Mexican mint oregano, and lavenders. Thick mulch was added and hopefully the space continues to flourish and turn even greener! The other area that was augmented was the citrus area. Since the 2012 planting, the trees have honestly struggled. We search for reasons, maybe the north wind, maybe lack of fertility and I also suspect the moles. So to give a better chance for them we added the tough Feijoa tree as it should provide more cover for the whole area. We intend to also add in six causarina’s in the coming days to help with wind and fertility. We developed simple guilds to compliments the mass of mint that is popping up here and there with curry leaf and pepino dulces. It’s an area that has a functional connection with our humanure system compost toilet in relative location) and should turn one day into a productive area even if the citruses are phased out by some unforeseen force. Soilwatertreesearthworks! Add in animal rotation and creative human interaction and a nice pattern is developed. Finally, students shared beautifully of their experience at Terra Alta and the confidence to implement through having the overall pattern laid so easily. Was a great group and we look forward to doing it again in the coming years! Thanks to all who made it possible and the energy that will thrive on here through this course and the energy that spreads further to Iberia! Hi! I’ve wanted to do this food forest with you but I was in the countryside doing rural tasks and meeting permacultors. I would like to know when will you have another food forest or if you may sugest another place for me to participate. Thanks you so much.